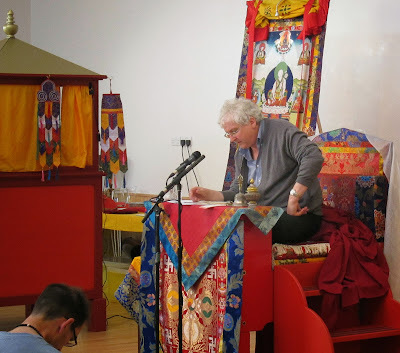 On Saturday 12th October Lama Jampa Thaye returned to Bristol to give the final instalment of Jetsun Drakpa Gyaltsen’s commentary on Chandragomin’s ‘The Twenty Verses on the Bodhisattva Vow’. People travelled from all over the UK and from as far afield as Holland and Portugal to receive this detailed explanation of the fundamental aspects of the mahayana buddhist path. Concluding the morning session Lama Jampa reminded everyone that to hear the teachings is only the first stage in a process: that this must be followed by detailed study and contemplation in order that we come to understand the full meaning of the teachings so that we may embody them in our lives. In the afternoon Lama Jampa bestowed the initiation of Yellow Dzambhala, the wealth deity most commonly practised within Dechen. He also gave the reading transmission for the practice. 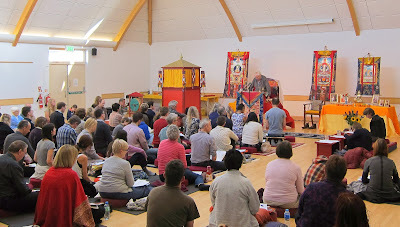 Finally Lama Jampa reminded us that whilst our endeavours to practise and serve the dharma may be small, as our efforts are aligned with the aspirations and activities of great bodhisattvas such as His Holiness Sakya Trizin, we can be confident that nothing is wasted and great things will eventually result. Lama Jampa’s next teaching will be in London on the 9th November when he will continue to teach Gyaltse Thogme Zangpo's commentary on the Seven Points of Mind Training and bestow the Initiation of Manjuvajra. For details click here.